"But, after all, if, as a child, you saw, every Mardi Gras, the figure of Folly chasing Death around the broken column of Life, beating him on the back with a Fool's Scepter from which dangled two gilded pig bladders; or the figure of Columbus dancing drunkenly on top of a huge revolving globe of the world; or Revelry dancing on an enormous upturned wine glass -wouldn't you see the world in different terms, too? " that Mobile is the birthplace of America&apos;s original Mardi Gras? That&apos;s right, Mardi Gras originated in 1703 right here in our port city. It was revived after the Civil War when citizen Joe Cain, fed up with post-war misery, led an impromptu parade down city streets. We&apos;ve been doing it ever since and we mark the annual occasion with majestic parades, colorful floats and flying Moon Pies. Mardi Gras celebrations begin two and a half weeks before Fat Tuesday and the Port City comes to life. Elaborate themed floats manned by masked mystic societies, mounted police and marching bands wind through downtown Mobile and surrounding areas, entertaining nearly a million revelers each year. Our Carnival is a family-friendly time of parties, balls, parades and revelry. Find your spot and get ready to catch Moon Pies, beads and trinkets. And not to forget the man who kept Mardi Gras alive, Joe Cain Day is observed the Sunday before Fat Tuesday. Mobile Mardi Gras kicks off in Downtown Mobile on February 15 and ends on Fat Tuesday, March 5! Stay up-to-date on all things Mobile Mardi Gras by following @MobileMardiGras on Facebook and Twitter. 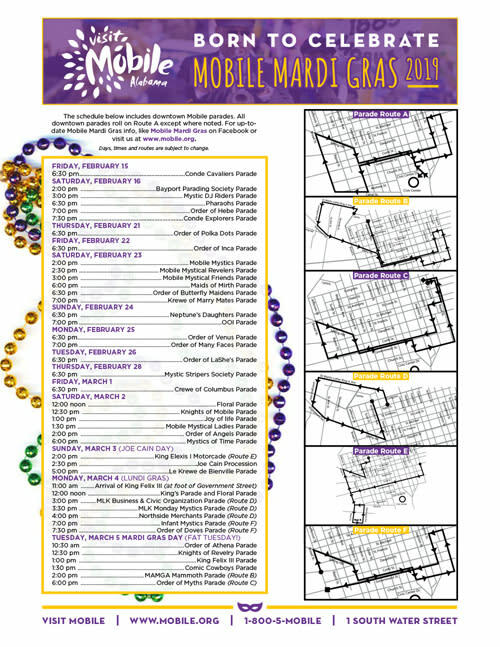 And, for even more Mobile Mardi Gras information, visit The Mobile Mask!